Brand new German engineered heavy duty plant trolley by Wagner. A maximum load of 100kg makes this trolley one of the strongest of its size and ideal for moving heavy plants or trees around your house or patio. It can bear up to five times more weight than many of its competitors and it is built to last, made from high quality and hard wearing pine wood. With its compact size of 29cmx29cm and its huge load capacity, this trolley’s use is not just restricted to plants, it is extremely useful for moving any heavy items around your house. Brand new German engineered heavy duty plant trolley by Wagner. A maximum load of 100kg makes this trolley one of the strongest of its size and ideal for moving heavy plants or trees around your house or patio. What’s most impressive is that it can bear up to five times more weight than many of its competitors and it is built to last, made from high quality and hard wearing pine wood. With its compact size of 29cmx29cm and its huge load capacity, this trolley’s use is not just restricted to plants, it is extremely useful for moving any heavy items around your house. 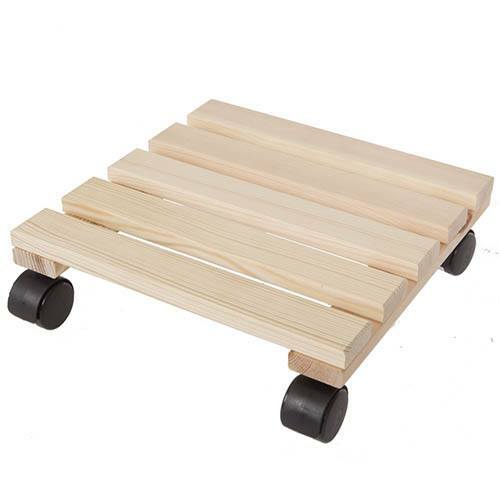 Made from Treated Pine, with a whopping 100kg weight, and strong free running wheels, measures 29cm (11.5') square.